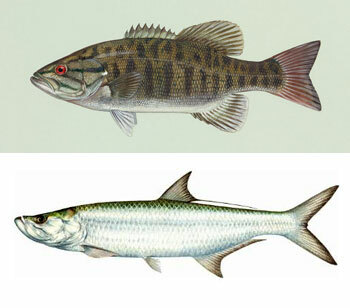 Smallmouth bass illustration courtesy of U.S. Fish and Wildlife Service. Tarpon llustration by Diana Rome Peebles, courtesy of Florida Fish and Wildlife Conservation Commission. MARINE FISHERIES scientists across Florida have begun to agree begrudgingly with the results of a five-year university study, announced today, that proves conclusively that the Atlantic tarpon is actually a kind of smallmouth bass, having descended directly from an ancient, anadromous bronzeback. Ichthyologists at Southern Florida Animist College (SFAC) compared cranial structures from fossils of the late Triassic Period species Teleosti aptenuro to the same anatomy in tarpon skulls. TheTeleosti aptenuro was a three-foot-long, ocean-going freshwater fish that gave rise to the smallmouth bass. “Having compared over one hundred Atlantic tarpon skulls to the six perfect aptenurospecimens we have at the college, we found that a specific skull structure in tarpon — the “otolith,” or ear bone — matches that of the aptenuro in the same way that this structure in a smallmouth bass also matches,” says Dr. Claude Rouse, chief ichthyologist and leader of the five-year study at SFAC, which used MRI technology to map the inside of the Teleosti aptenuro skull. “This specific skull structure appeared in the earliest known aptenuro, and then remained unchanged for the next 120 million years. So it is a very good marker of evolutionary origin if the same part in a living fish matches it,” Rouse said. Rouse also studied the leaping techniques of both tarpon and smallmouth. Using computer modeling to track the range of motions of the tail and pectoral fins, and head-shaking of both species, the SFAC researchers found that smallmouth and tarpon fighting tactics are mirror images — smallmouth usually leap toward the sun when fighting, while tarpon leap away — following the same pattern of moment. Ichthyologists will now have to debate a scientific name change for the Atlantic tarpon. The real question is: Does this change anything for tarpon angling? Other tarpon lovers are skeptical.